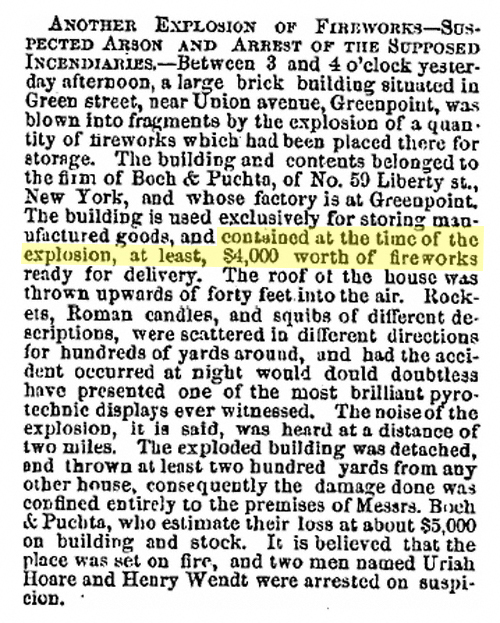 From The Brooklyn Daily Eagle Archives & Beyond: Fireworks! Yours truly has been hearing a lot of fireworks lately. In fact, I heard some being discharged one very short block away from the location of a two-alarm fire which came to pass recently. Clearly a lesson has not been learned. 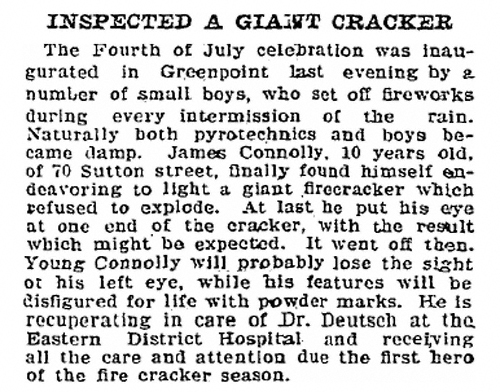 For better or for worse, dear readers, we Greenpointers love us some fireworks. This in and of itself would not be a problem if we could simply use them correctly. Without further ado here are a couple of items from the Brooklyn Daily Eagle archives for your Independence Day reading pleasure. We’ll start with a personal favorite of yours truly: the tale of one Uriah Hoare. Enjoy! 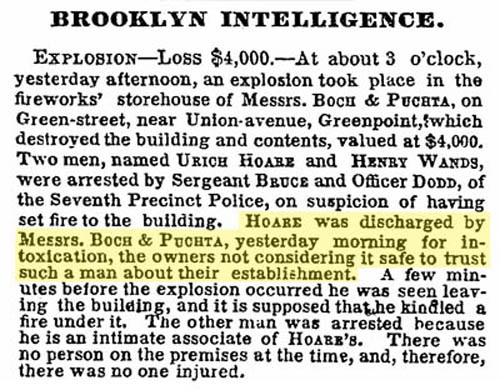 Those of you who are wondering (as I did) as to why Mr. Hoare was arrested on “suspicion”, I found the answer via an item from the New York Times’s “Brooklyn Intelligencer” section dating from the very same day! It is truly something special. And of course, when playing with fire crackers it is highly advisable to keep said articles pointed away from one’s face. On June 30, 1902 a Sutton Street resident named James Connolly learned this lesson the hard way. Have a fun— and safe— 4th of July Garden Spotters!